Predicting the sketches on Saturday Night Live with host Ben Affleck. What will happen when Ben Affleck hosts tomorrow night? Argo see for yourself! 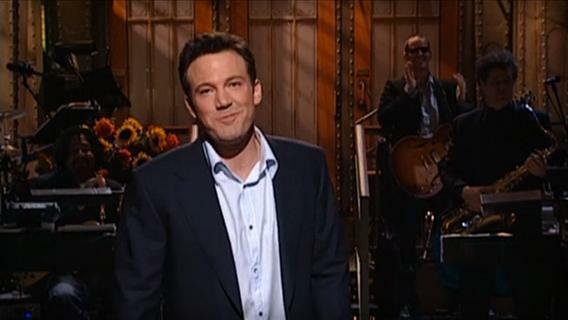 Ben Affleck will return to host SNL this Saturday. This article originally appeared on Previously.TV, a brand-new TV commentary and recap site created by Tara Ariano, Sarah D. Bunting, and David T. Cole, the original founders of Television Without Pity. Visit Previously.TV for more. At the IRS, officials try to come up with reasons to target investigations at organizations against which they have personal axes to grind, from the gym that kept charging Dave (Tim Robinson) for months after he quit to the coffee shop that won’t let Doris (Kate McKinnon) bring her corgi inside. Host Ben Affleck is interrupted by Kenan Thompson with a question about where he keeps his Oscar, forcing Affleck to remind him (rather angrily) that he actually has two. The smartphone wars escalate, with one side’s phones getting thinner and smaller over the course of the spot, while the competition’s get larger and more unwieldy. At Today, Matt Lauer (Affleck) and his co-hosts, Al Roker (Thompson) and Savannah Guthrie (Vanessa Bayer), refute a barrage of anonymous sources telling gossip columnists what Lauer is really like to work for, with Lauer growing increasingly angry as more and more reports roll in. After his success with The Great Gatsby, Baz Luhrmann (Jason Sudeikis) announces plans for lavish 3-D adaptations of other modern American literary classics, including To Kill a Mockingbird and The Grapes of Wrath. Faced with three unruly teenagers (Bill Hader, Bobby Moynihan, and Robinson), a police captain (Sudeikis) invites convicts Lorenzo McIntosh (Thompson) and Doug MacRay (Affleck) to set them straight. Upper East Side mother Bronwen Stilwell (McKinnon) explains why she hired a disabled guide to cut the lines at Disney World; Ben Affleck’s three best friends from growing up (Fred Armisen, Bayer, and Matt Damon) share their feelings about Affleck’s success; Stefon (Hader) suggests places families may want to visit if they travel to New York this summer. What’s Up With That? features an appearance by a pair of barely competent sword swallowers (Affleck and Taran Killam), and finally, at the end, Lindsay Buckingham (Hader) gets interviewed, albeit for a very short length of time. In the wake of the news that Columbia, until this week, offered a scholarship endowed by a woman who mandated that it be awarded only to white students, a committee calls an emergency meeting to review extraordinary conditions placed on other scholarships at the school. Inspired by the great success of Iron Man 3, Ben Affleck visits Marvel Studios to share his ideas for the long-awaited sequel to Daredevil. At the corner bar, four buddies (Affleck, Hader, Armisen, and Sudeikis) take turns during the verses of “Slip Slidin’ Away” to make horrifying confessions about their lives. This article originally appeared on Previously.TV.